I picked this up browsing the game aisle at the department store. We were planning a party and I was looking for something that could be set up quickly and had rules that were easy to understand. I saw the box for Pucket and it grabbed my attention. It was a handsome wood constructed game that promised “frantic, fast-paced action”. The price was reasonable so I grabbed it up. Gotta say… it was a big hit. The premise for the game is pretty evident by the large top-view pic of the game. Two players face each other over a play surface that resembles a tennis court. Instead of a net, there is a wall dividing the area in half. Shallow wooden walls surround the area. An elastic bungee cord stretches across each end. The objective is to use the elastic chord to shoot wooden pucks through a hole in the wooden wall. The hole is only slightly wider than the puck. Each player starts with eight pucks on their side. The first player to shoot all of their pucks to the other side wins. This is not a turn based game. Players shoot their pucks at the same hole at the same time. This is how wackiness ensues! Pucket comes packed in a clamshell storage box. When it closed it has a nifty carrying handle at the top. The box is roughly the size of a briefcase and is heavier than you would probably expect. The playing surface is smooth with a faux woodgrain pattern. The underside is lined with felt. There are four rubber feet mounted on each corner. They do a good job of preventing the game from shifting during play but could probably stand to be a bit bigger. The elastic bands are about 1/8″ in diameter and give a satisfying “twang” while firing pucks. The pucks are solid wood, about the size of a quarter and half an inch thick. Set up is a breeze! Beyond stretching the cords across the ends, there is no assembly. It takes two seconds. Each end of the elastic cord has a wood bowl-shaped stopper that slides into a matching recessed area on the frame. It provides a good fit and does not move during gameplay. It’s a good looking setup. The natural wood look and contrasting light/dark finishes give the game a vintage flair. What Are The Rules Of Pucket? Don’t take turns. This is a free-for-all. Shoot the pucks as quickly and accurately as you can. What is Pucket Gameplay Like? To be honest, it’s a ton of fun to play. It’s fast and frantic just like it says on the box. As you try to clear your side of pucks you will run the gamut of human experience. Frustration when you hit a cold streak and can’t get a puck through the gate to save your life. You’ll have steam-shooting-from-your-ears anger when you get a rhythm going and have several pucks in a row collide with the opponent and bounce back at you. Anxiety when you notice your opponent only has a few pucks left. You get jubilation when you finally clear your side of pucks and win. Not bad at all for a simple game made out of wood. 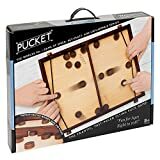 I’ve playtested Pucket with adults, teens and my 4 and 5-year-old boys. Adults and teens immediately pick up the concept and have a good time. They may scuffle their first game but get a feel for it towards the end. Everybody wants to play another game afterward. Games between 2 players that know what they’re doing can become intense, drawn-out affairs. Quite often shots hit each other at the gate and cancel each other out. This continues for a time until someone makes just a small mistake. This opens the gate for the other player to go on a run. But just as quickly as one player grabs momentum they can lose it back. My young sons were both able to quickly understand the rules. They really seemed to enjoy pulling back the string and shooting the puck. They both giggled throughout the whole game. I’ll take that as their stamp of approval. I was able to keep their interest for about a half hour. Hey, anything that keeps me from having to watch another episode of Paw Patrol is worth it in my book. Included in the directions are some cutesy names they have for situations that may arise during a game. My game room is no place for whimsy. I ban anyone who uses them. Gatekeeper’s dinner – when a poorly aimed puck becomes lodged in the gate. Feed your opponent the dinner by knocking it through with another puck. Flying Sailor – when a puck flies over the gate. The sender must take it back. Cardinal’s Revenge – when a too well-aimed puck bounces off the opposite elastic and comes back through the gate. Neptune’s Kiss – players fire at the same time, causing the pucks to “kiss” at the gate and rebound. Instructions offer variations for experts and tips for tournaments! Does Pucket deserve a spot on your game shelf? Without a doubt, YES! It’s got a lot going for it. The game board and pieces are well constructed. Both kids and adults can play. About the only negative I could come up with is the cost. Some may hesitate at paying more than a few bucks for what appears to be a simple game with no electronic components. I know I did. After taking the plunge and weighing the amount of entertainment we’ve got from it I believe it was worth the cost.